What makes digital marketing both exciting and frustrating is the quickly growing different opportunities to get your product to market and the challenges to keep up with those ever-growing outlets. Marketers have a tough time keeping up with this quarter’s hot properties and digital extensions – let alone having the opportunity to research or know about all of the latest and, perhaps, most cost-effective way to spread the word about their product. There are platforms that can be leveraged popping up all the time and companies need to be open to finding them. In one case, a large company has created such a platform for enabling other companies to spread the word in an unexpected way. With the enticement to Get On The Shelf, Walmart’s recently launched online contest enables companies to vie for inclusion in the retail giant’s site, receive shelf space in the stores and more. The contest allows people to place videos touting their products of any kind – with any level of production value – and enter a fan voting mechanism that is meant by Walmart to mimic that of AMERICAN IDOL (whose newest season began last night – the same day as the Walmart press release.) After an entry period that ends February 22nd, there will be two votes that winnow down finalists in the same structure as the Idol juggernaut. In this case, your product can become a star – at least at Walmart – but there’s more value than that. Beyond the face of the contest, it provides some great secondary benefits that Walmart is calling out on the site and some that are not. In some ways, it’s a benefit even for those who don’t win. By allowing virtually anyone to place their products on the site for judgement by the public, it’s a defacto bit of market research on a larger scale than the North Carolina woman selling a marmalade could ever hope for. The opportunities go way beyond local mom-and-pop endeavors. 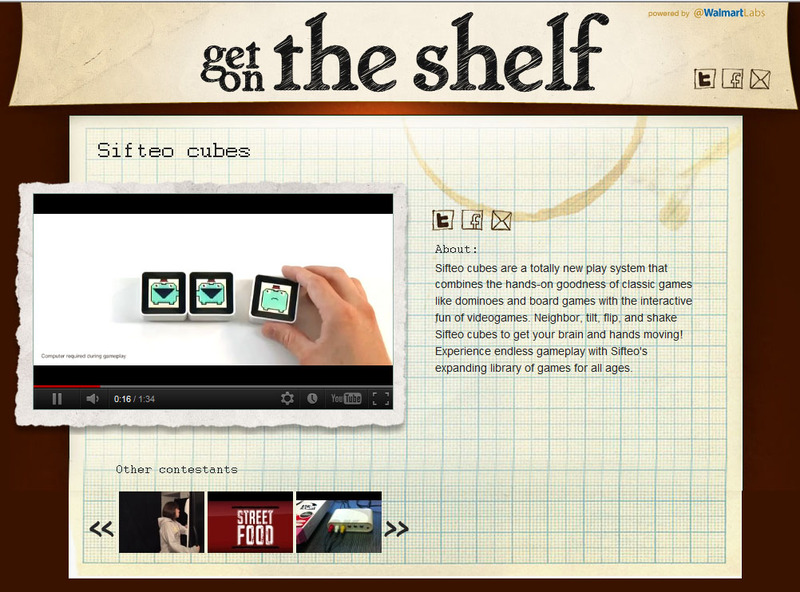 A product called Sifteo Cubes is one of the entrants and I had seen them before. Wherever I had seen them, I did not get a full picture of what they actually did. By coming across them here, I became more intrigued. So, that extra point of contact with a consumer in a different way could be helpful. Additionally for a company that might already have their product established on a small-scale, Walmart says they will help selected companies scale up production. Beyond possibly gaining another distribution outlet, companies could parlay the interest from the site – votes, views, etc. – to receive further financing or learn how they might be able to better position the product. Now its up to Walmart to do their part by getting the word out and driving traffic to this site. It’s all fine and dandy to say you are doing it – and it is some nice spin for them to intimate that they are helping the local smaller companies – but it really means nothing more than a press release if they don’t advertise it properly. I have no idea whether they have a spend against AMERICAN IDOL on Fox, but it would make sense to include at least one spot to tout this contest. Could the price of the spot be too high for something like this? Maybe. I believe they are doing this as a brand extension and promotion, so if the spot is constructed the right way, it makes perfect sense to run a spot themed to Get On The Shelf. Unless you are concerned about others with deeper pockets duplicating your product – which should lead you to question how sound your business plan in – it doesn’t hurt to leverage these types of opportunities. In the least, you are garnering free video views for your product with opportunities for tremendous upside. With marketing platforms like this, you’ve got to be open to finding them, vetting whether they are good for your company or product and then setting realistic goals for what you want to get out of it. If you’re only aiming for the goal of winning the contest – in this case – you are wasting some precious opportunities (market and positioning research, word of mouth, buzz). That next great digital marketing platform could be right under your nose. Don’t let your eye on the (perceived) prize blind you from the opportunities that can come from the most random of places.